If you’re at all into hair, balayage is a term you’ve probably heard thrown around a lot lately. But if you’re having trouble figuring out the difference between balayage, ombre, sombre, babylights and all the other buzzwords that those “every day’s a great hair day” girls are hashtagging their salon chair selfies with, don’t stress. A little education: Balayage isn’t a specific color or look, but rather the actual technique that stylists use to apply highlights. The name means “paint” or “sweep” in French, so with balayage, the dye is applied to the hair freehand, using vertical strokes and no foil, as if you were painting color onto the hair. This way, the stylist can easily build the level of color from the mid-shaft to the ends so that the results are softer, more natural-looking and grow out without screaming, “I haven’t been to the salon in a while.” And because it’s not really something that non-pros can achieve at home, balayage is head-turning and luxe looking. What kind of hair works best for balayage? The method isn’t just used for getting those sun-kissed highlights that have made celebs like Miranda Kerr, Naomie Harris and Sarah Jessica Parker fall in love with it — balayage can also be a little wild. When the technique is combined with mermaid colors, an on-trend galaxy palette or silver granny hair, you get a rich ombre that blends two or three (or five) vibrant hues seamlessly. Plus, because balayage hair color is never harsh, it turns out amazing on all base colors and hair textures. So whether you’re ready for candy-colored hair or are just experimenting with highlights for the first time, balayage is a versatile choice. To prove it, we’ve rounded up 50 of the most lust-worthy balayage hair color ideas from celebrities, models, hairstylists and Instagram It girls that will make you want to get to the salon stat. 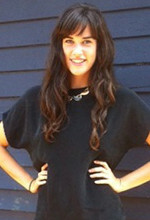 Ellen Freeman has been contributing to the Fashion Spot since 2010. Since graduating with a degree in comparative literature from Haverford College, her celebrity fashion, wellness, arts and travel writing has appeared in publications including the Matador Network and Philadelphia Weekly. Also a certified yoga instructor, Ellen currently lives in the Japanese countryside—but misses thrift store spelunking in her hometown of Portland, Oregon.